Welcome to The Scarecrow of Romney Marsh Costume Page. My wife, Elaine, and I were stunned to hear of Patrick's passing this week. He, as many of you know, was both a longtime business associate and very close friend. Patrick did his last interview, ever, (for Disney's DVD release of "DR. SYN ALIAS THE SCARECROW") for me even though there wasn't anything he hated more. I am eternally grateful for his work, his legacy and his friendship.I will never forget the time my wife and I sat with him at his breakfast table at his beautiful home in Pacific Palisades while he did one-man plays for us while jumping up every few minutes to make us another coffee. A lot of people don't realise what an incredible sense of humor Patrick had. It was very dry but infectious and once you were witness to it you could see it, in everything he did...even in the Prisoner. Patrick was the warmest, classiest, most thoughtful and meticulous person we have ever known. Patrick McGoohan's professional accomplishments and impeccable personal reputation are widely known and well documented so we will not reiterate them here. Instead, we'd like to reflect on and share a few personal thoughts about this fine man. What started as just another business association eventually became a true and treasured friendship. Beneath the great intellect, which was so evident in his flagship work, THE PRISONER, was an extremely warm and gracious nature. No. 6 and King Edward the Longshanks may have been less than cordial characters but Patrick McGoohan had true heart and a generous spirit. Though his fans are legion, he remained humble and was both unwilling and uncomfortable in talking about himself. Even in writing this memorial, I can't help but feel a bit of a sense of betrayal to that modest side and am certain he would disapprove mightily of all the glowing words being written by so many this past week. For most, what will be missed is his work and the promise of more in the future; for us, it will be the deep chuckle over the phone, the dry wit in a note and the teasing wink of a blue eye. We will miss our dear friend for a very long time. 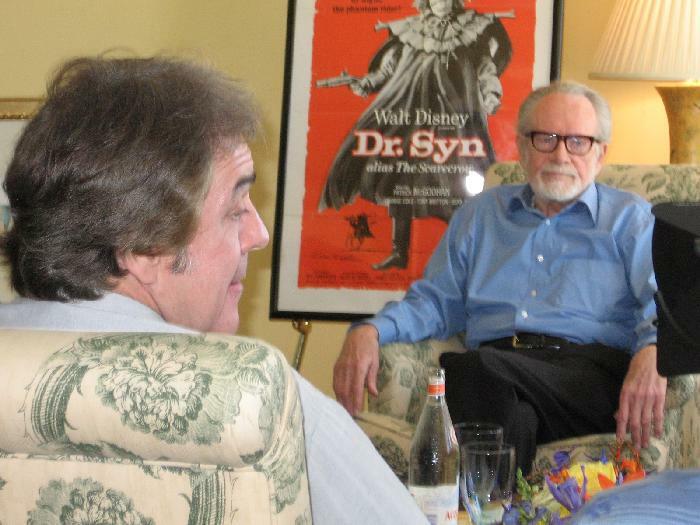 Larry Green interviewing Patrick McGoohan for the Walt Disney "Dr. Syn Alias The Scarecrow" special DVD release of 2009. 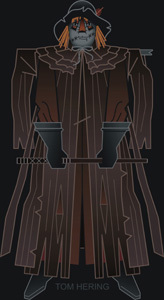 CLICK HERE FOR OUR SCARECROW MASK SETS AND THE SCARECROW'S COACHMAN'S COAT! CLICK HERE FOR HELLSPITE MASK SETS AND HELLSPITE'S HUNTER'S COAT! CLICK HERE FOR CURLEW MASK SETS AND CURLEW'S HUNTER'S COAT! CLICK HERE FOR EXCLUSIVE PATRICK McGOOHAN AUTOGRAPHED PHOTOS AND LOBBY CARDS!